One benefit of planting cover crops is their contribution to weed management. While several factors contribute to the inhibition of weeds by cover crops, the physical barrier of cover crop residue on the soil surface is most important. 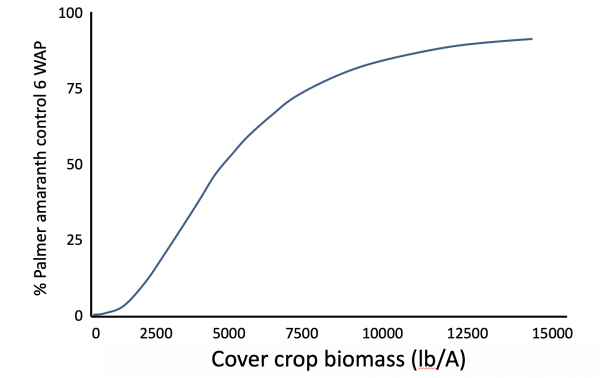 Research has shown a strong relationship between the amount of cover crop biomass at termination and the level of weed control provided by the cover crop (Figure 1). from Webster et al. 2013. 1) Planting and termination date. Compared to areas where cover crops have more widespread adoption, Iowa’s growing season limits how much biomass is produced prior to normal corn and soybean planting dates. 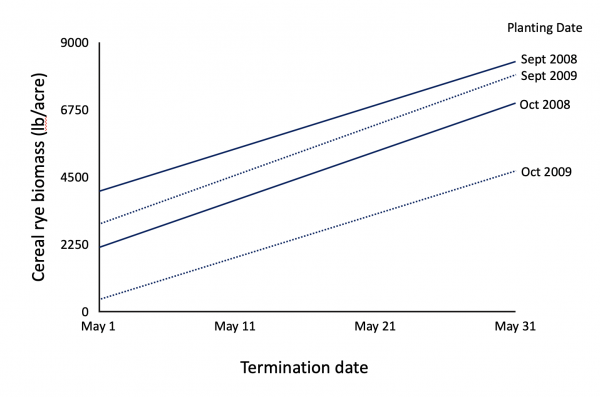 Both planting and termination dates of cover crops influence biomass accumulation, but to achieve levels needed to provide consistent weed suppression the termination date will need to be delayed until after typical planting dates for corn and soybean (Figure 2). Cereal rye planted in September in central Iowa had less than 4000 lbs/A biomass during the first week of May, whereas with an October planting date less than 500 lb/A was present. In central Pennsylvania, delaying termination 10 to 20 days in the spring resulted in a doubling of cereal rye biomass (Nord et al. 2011). A 5 to 15-day delay in termination was required for cereal rye planted in October to accumulate as much biomass as rye planted a month earlier. Timely establishment of cover crops reduces, but doesn’t eliminate, the delay in termination required to allow cover crops to accumulate sufficient biomass to suppress weeds. Figure 2. Cereal rye biomass at termination as affected by planting and termination date. Adapted from Nord et al. 2011. 2) Cover crop species. A variety of species are promoted as cover crops, and they vary widely in their attributes. In terms of weed suppression, species that overwinter and accumulate the most biomass provide the best weed suppression. When a cover crop mixture is planted, the species that accumulates the highest biomass is responsible for the majority of weed suppression. Under Iowa conditions, cereal rye has the best chance of producing sufficient biomass to contribute to weed control. Many species used as cover crops, including cereal rye, produce compounds (allelochemicals) that can suppress plants growing in close proximity. Determining how much the allelochemicals contribute to weed control in the field is difficult due to the complexity in separating the physical impact of the cover crop residue from the effects of allelochemicals. Research investigating weed suppression by cover crop mixtures found their impact on weeds was largely due to the rapidly growing grass species in the mixes, illustrating the importance of cover crop biomass (Baraibar et al. 2018). Will cover crops allow a reduction in herbicide use? This is a difficult question, and no single answer fits all scenarios. In the short term, most situations will require similar herbicide use when cover crops are incorporated into the system. However, if cover crops increase the consistency of weed control they should allow a less intensive herbicide program in the long run. When cover crops are planted in a timely fashion, they have a large impact on the establishment of winter annuals such as horseweed and field pennycress. The presence of the cover crop could eliminate the need for a fall or early spring burndown application. Most cover crop species, including cereal rye, are easier to kill than certain winter annuals (e.g. horseweed). Winter annual weeds that do establish should be smaller where a cover crop is present, and thus would require a less intensive burndown treatment than in fields with no cover crop. The suppression of summer annual weeds by the cover crop dissipates as its residue decomposes following termination. When cereal rye is terminated prior to stem elongation, the plant residues degrade fairly quickly and weed suppression is short-lived. In this situation there is unlikely to be a big impact on the amount of preemergence and postemergence herbicide needed. When termination is delayed until after stem elongation, the lignified stem tissue persists longer and will have a greater impact on weed establishment than with earlier termination dates. With larger cover crops the majority of preemergence herbicide is intercepted by the cover crop. The fate of herbicide intercepted by the cover crop residue varies depending on the herbicide’s chemical properties, but most research indicates their activity is not consistently affected. More rainfall may be required to move the herbicide into the soil profile than when it is sprayed directly on the the soil surface, and less uniform distribution of the herbicide in the soil could result in less consistent control. People often wonder if rates of preemergence herbicides can be reduced or if the application of preemergence herbicides can be delayed when termination is delayed until rye is 24” or taller. The premise is that the large cover crop biomass will control weeds for at least two to three weeks, therefore reducing the need for a preemergence herbicide. Reducing the rate of preemergence herbicides is not recommended since this results in less herbicide being present as the cover crop residue degrades. Delaying application of the preemergence herbicide until an early postemergence application (2-3 weeks after planting) could be beneficial since this will extend the activity of the residual herbicide later into the season. It can be thought as a layered residual program where the cover crop provides weed control in the initial weeks after planting, then the preemergence herbicide extends control until canopy development. A limitation to this approach is that many fields lack a uniform stand of cover crop. Areas with less cover crop biomass would be prone to weed escapes, eliminating any benefit achieved through the delayed application. Scouting fields to determine the uniformity of the cover crop is critical before modifying weed management plans. In summary, weed suppression is one of the many potential benefits of incorporating cover crops into a production system. To maximize the weed control benefit, the cover crop must be managed to increase the amount of biomass at termination. In Iowa, cereal rye is the species with the best ability to produce sufficient biomass to consistently control weeds. The need to terminate cereal rye at least 10-14 days ahead of corn planting to protect corn yield limits weed suppression provided by a cover crop. There is greater potential with soybean to maximize the weed suppression benefit of cover crops, but to do this, crop planting typically needs to be delayed at least two weeks from typical planting dates. Baraibar, B., M.C. Hunter, M.E. Schipanski, A. Hamilton, and D.A. Mortensen. 2018. Weed suppression in cover crop monocultures and mixtures. Weed Sci. 66:121-133. Webster, T.M., B.T. Scully, T.L. Grey, and A.S. Culpepper. 2013. Winter cover crops influence Amaranthus palmeri establishment. Crop Prot. 52:130-135.